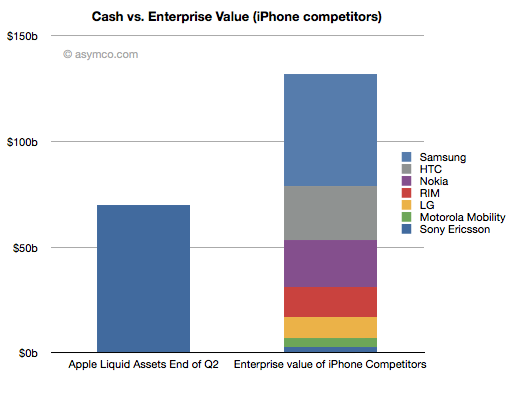 The next time you hear someone talking trash about the iPhone or Apple’s future in the mobile world, present this impressive fact: Apple has enough cash that it could buy outright most of it’s hardware competitors in the mobile phone industry. Yes, as ridiculous as that sounds, Apple could buy most of the industry, that means Apple could pay cash and acquire HTC, Nokia, RIM, LG, Motorola Mobility, and Sony Ericsson, the only remaining competitor in the mobile vendor space would be Samsung, which is worth $53 billion. I wonder what Apple’s competitors think about that? It seems like no brainer to acquire HTC right now. Kinda spendy but I see them become a huge player. Right now it would probably be approved by the powers that be, and I think besides Samsung, pretty much the only threat to continued growth. Truthfully, Apple isn’t going to think twice about buying any of these competitors. Apart from patents (which Apple has enough of it’s own), what would they gain?